Bold, groundbreaking, unique, and original. It's HBO. After more than a decade of marriage and two children, Frances (Sarah Jessica Parker) has suddenly begun to reassess her life and her strained relationship with her husband Robert (Thomas Hayden Church). But she soon discovers that making a clean break and a fresh start is harder than she thought. The story of a very, very long divorce, the show follows Frances and Robert as they grapple with the fallout from their failing marriage, not just for themselves, but also for their children and friends, ranging from awkward public encounters to difficult private therapy sessions. 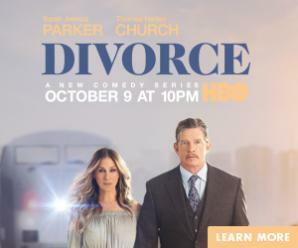 Premiering Sunday, October 9th at 10 pm! We asked our bloggers to share some of their own divorce stories. Take a look and see how you could win a $100 Gift Card! Divorce Sweepstakes on BlogHer runs from 9/26/16 through 10/23/16 and is only open to individuals who, at the time of entry deadline, are legal residents of the United States and are 18 years or older. Click "here" to read the official rules. Winners will be randomly selected from all eligible entries. Good luck!